Cook a cup of quinoa, in water or stock. 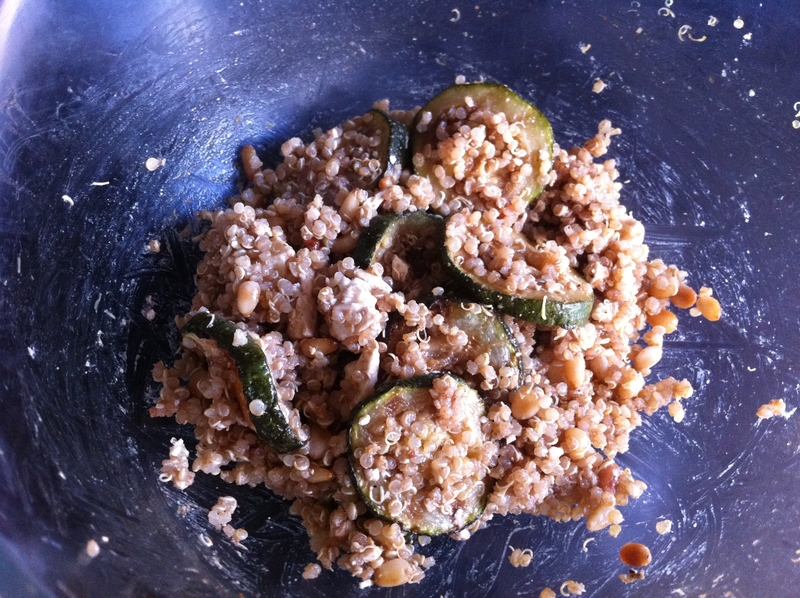 Take one large or 2 small courgettes, and cut into rounds. Lightly oil a griddle pan, and cook the courgette rounds so that they get lovely stripes on each side. In a dry frying pan, toast a handful of pine-nuts. Combine all ingredients in a large bowl, crumble some feta cheese into it, and add dressing of your choice. I used a balsamic dressing, which was probably a bit strong – lemon juice would be nicer. I think it could be made more attractive – maybe some halved cherry tomatoes would make it more colourful. 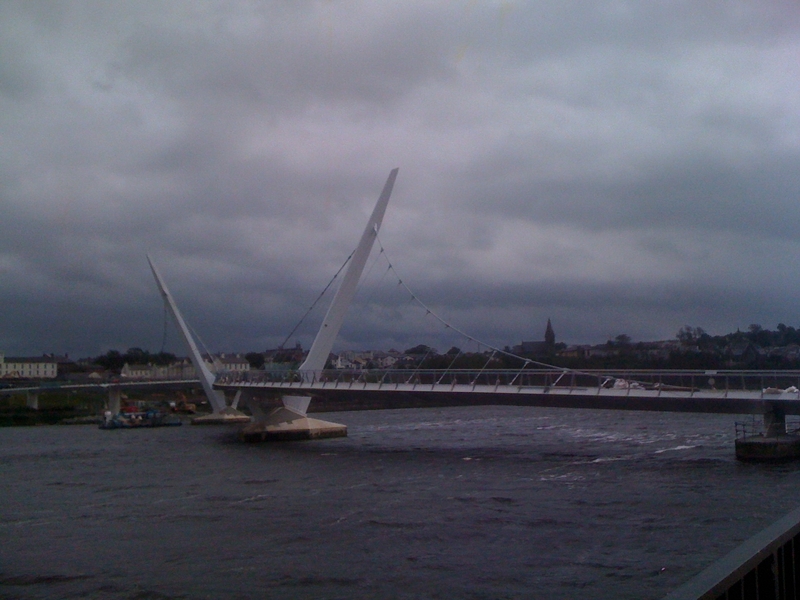 This is the new Peace Bridge in my home city, Derry. The picture was taken a few weeks before its official opening. It’s a curving S-shape, representing the road to peace which isn’t a straight line. And it connects the mainly nationalist city side of the River Foyle with the mainly loyalist waterside. It goes from beside the Guidlhall, scene of some of my earliest dancing performances, to a new peace park in the grounds of a former army barracks. As well as having lovely pointy support spires, I’m amused by the fact that the word point is close to pont, French for bridge. I had wanted to put a photo of my husband’s chest scar, after his recent heart surgery, but he wouldn’t let me unleash that on the internet! While he was in hospital, they recommended that he take off all jewellery. 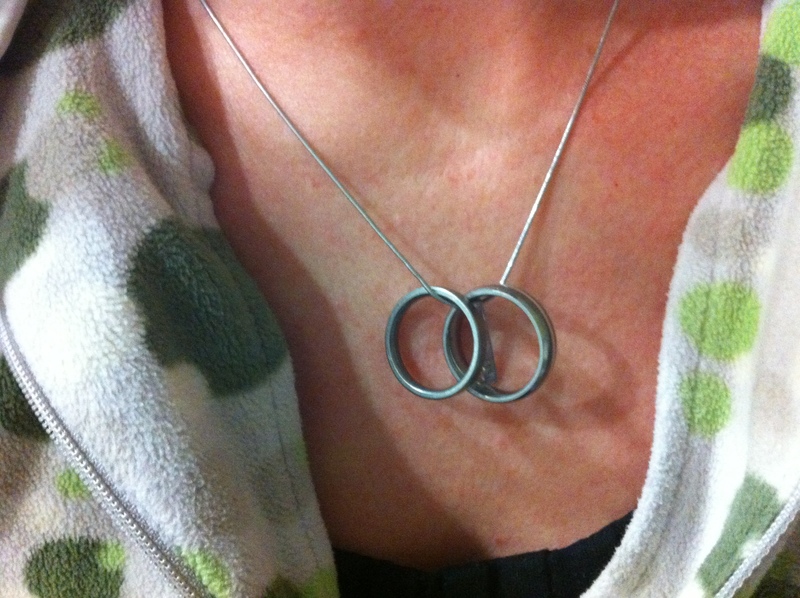 So I wore his wedding rings around my neck, symbolically next to my heart, while he was there. It was a real comfort to have them so close to me – every time I missed him, or wanted to tell him something, I could just reach for the chain around my neck and give the rings a little caress. Now, he did put them back on when he’d recovered and was out of ICU, but he took them off again for a final X-ray. And currently cant find them. The search continues, but in the meantime this photo is even more important than ever. 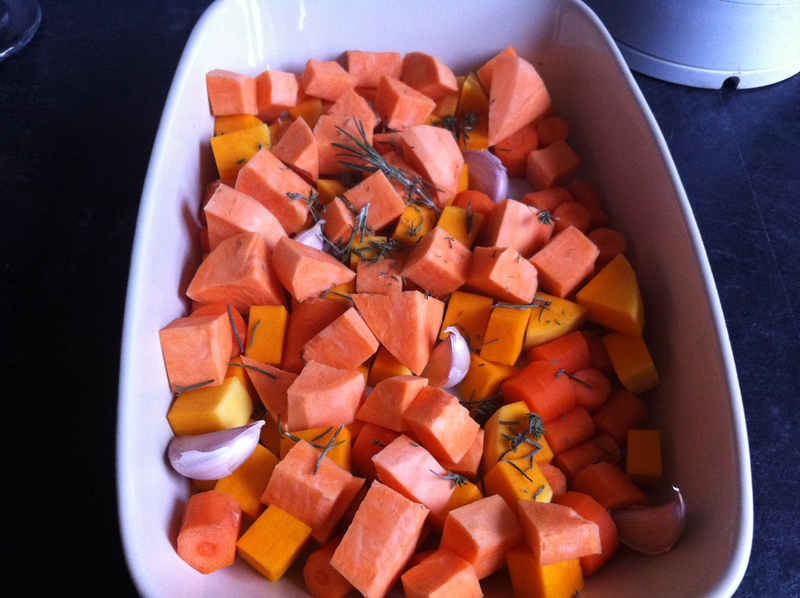 This is one of my favourite recipes – roast roots. Tuck in some herbs – rosemary and thyme work well. And some whole unpeeled cloves of garlic if that’s something you like. Season with black pepper and sea salt. Toss in some oil – I used canola, but olive or sunflower would be fine. Put in a roasting tray, and pop in the oven at about 180 degrees C for 30 mins, stirring half way through. 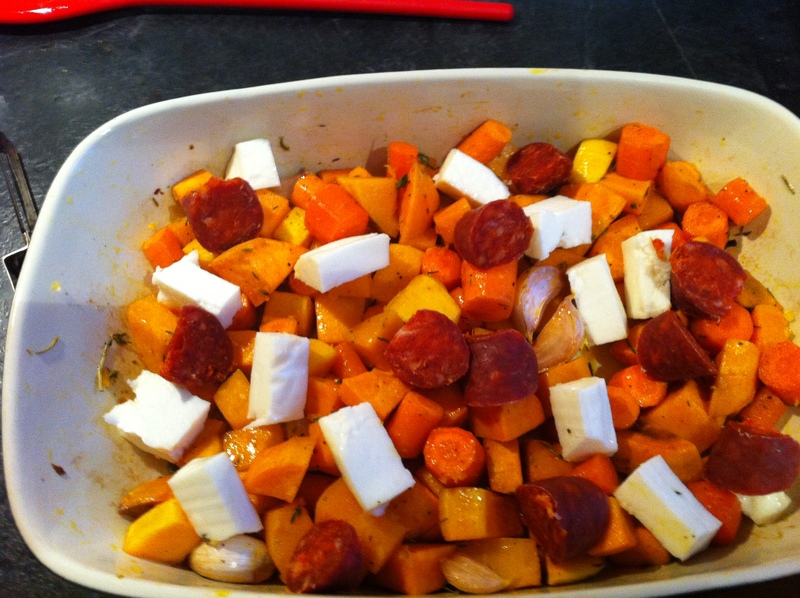 Add in some cubes of haloumi andchorizo. Back in the oven for another 30 mins. Though this is very forgiving – another 10 mins while you finish cooking a slab of meat will not be a problem. 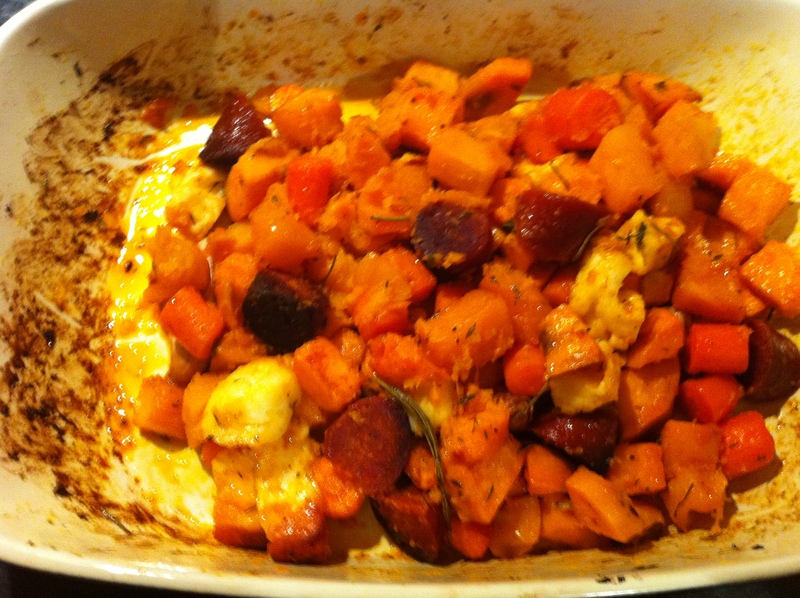 Omit the chorizo for a vegetarian side dish. Blitz any leftovers with some stock for a winter soup, served with grated parmesan, or shards of parma ham crisped under the grill. The weather this week has been bitterly cold – I know it has been severe across parts of Europe. One of the local indicators of temperature is the lake in Hillsborough forest. 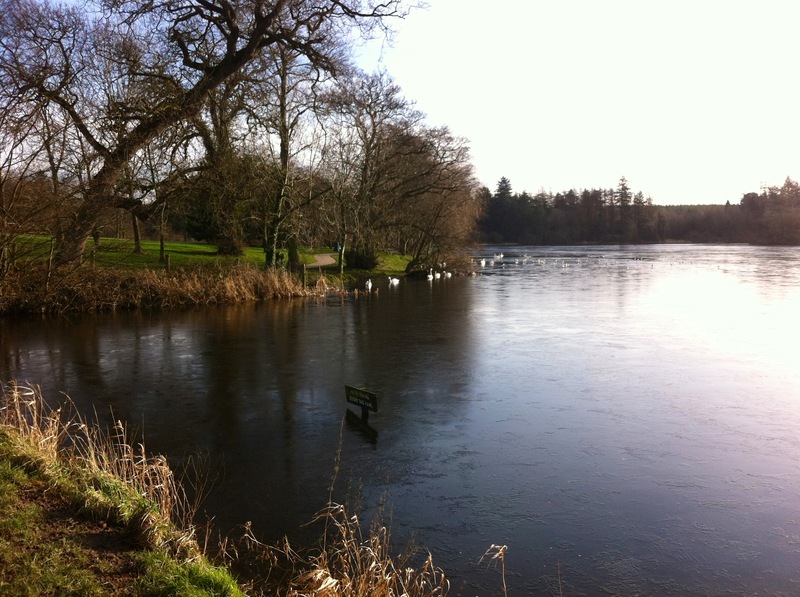 It was frozen this week, causing the many ducks and swans to waddle uncertainly across the slippery surface. This is one of my most common dog-walking routes. And its popular with many locals, the car park is usually full, even on a mid-week morning! It was Mini’s first experience, and she seemed to enjoy it immensely.